The fifth DARE seminar was organized in Rotterdam and presented two comprehensive overview studies of entrepreneurship research in the Netherlands. One study focused on the different types of entrepreneurship and what role these types play in our economy and society. A second study explained the contribution of SMEs to the economy. This DARE event was organized in cooperation with the Erasmus Centre for Entrepreneurship (ECE) at the ECE Campus, Rotterdam Science Tower. Within the research framework on SMEs and Entrepreneurship, Panteia carried out an overview study that presents state of the art research findings on types of entrepreneurship. Entrepreneurship is a heterogeneous phenomenon that can have different manifestations in our economy, varying from solo self-employed to employer firms and from women entrepreneurship to green entrepreneurship. Furthermore within these different types of entrepreneurship, various roles can be observed that each contribute to the economy or society in a different way. For example, entrepreneurs can be experimentators or imitators, they can be initators or enablers, each with different final effects for economic growth or societal value. Building on the Entrepreneurial Ecosystem (Stam, 2014) the presented study introduces a framework that explains how these different types of entrepreneurship play a contributing role to economy and society. Some entrepreneurial types were discussed in more detail. For instance, it was argued that solo self-employed play a crucial role in enabling better and more efficient entrepreneurship in larger companies by lowering risks and offering specialized skills and knowledge. 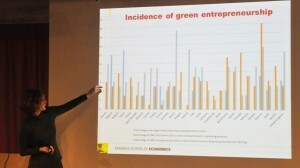 Also, green entrepreneurs are different from more “regular” entrepreneurs because they recognize opportunies that are both profitable and sustainable. However they are often more affected by policy implications. A second overview study that was presented addressed the contribution of SMEs to the economy. A triptych approach was adopted that first reviewed the research findings on the prevalence of SMEs and contributions in terms of employment and other economic outcomes (innovation, productivity). A static perspective on the contributions revealed that more than 95 percent of SMEs account for 60 percent of the total employment. This implicates that approximately 2.500 large firms are responsible for 40 percent of the total employment. In contrast, a dynamic perspective on the economic contribution of SMEs reveals that they show less growth potential in employment and productivity. The second part of the triptych approach discussed the contemporary Dutch entrepreneurship policy, that is predominantly aimed at assisting ambitious, innovative and value creating entrepreneurship. The final part of this study consists of indepth interviews with possible policy implications. 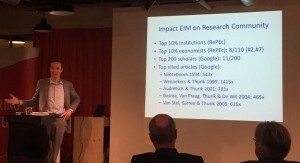 A short overview of the impact of EIM/Panteia’s research program on SMEs and entrepreneurship over the years reveals an impressive track record: top ten percent institutions (RePec), top ten percent economists (8/110; RePec), top two hundred scholars (11/200; Google) and several top cited articles in Google. The knowledge creation was substantial and also formed a sound foundation for policy and practice, because the output was always very practice orientated. Perhaps a minor critique on the outcomes of the framework program, may be that the research was to some extent too instrumental and did not generate paradigm shifts in economic policy. Finally, some implications were discussed for the post-research program period. 1. provide a portal for academic research and education in entrepreneurship in the Netherlands. 3. provide input to the long term research program.